WASHINGTON -- Defying threats from Congress, the District of Columbia legalized possession of marijuana for recreational purposes on Thursday, becoming the first place east of the Mississippi River with legal pot. The new law took effect at 12:01 a.m., despite last-minute maneuvers by Republican leaders in Congress and threats that city leaders could face prison time. Democratic Mayor Muriel Bowser, who took office in January, said it was her duty to implement the initiative city voters approved overwhelmingly in November. "This is a major milestone on the road to ending marijuana prohibition in the United States," said Robert Capecchi of the Marijuana Policy Project, which advocates for legalization. "If the president can brew and drink beer in the White House, adults should be allowed to grow and consume a less harmful substance in their houses." Possession of up to 2 ounces of pot for use at home is now legal, and people are also permitted to grow up to three mature plants. 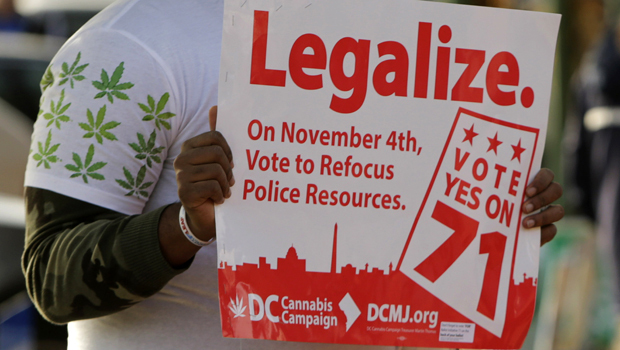 Smoking marijuana in public remains illegal, as does buying or selling the drug. On Tuesday, Alaska also implemented a voter initiative legalizing the private use, sharing and cultivation of recreational pot, but lawmakers there won't implement the next phase - creating a regulated market where legal marijuana can be sold and taxed - until 2016 at least. The District's initiative, approved by 65 percent of the voters in November, only addressed personal possession, not taxation or regulation, and District leaders acknowledge that Congress blocked any effort to implement a legal marijuana market. But they believe Congress acted too late to stop legalization for private use. Rep. Jason Chaffetz, a Utah Republican who chairs the House Oversight Committee, urged Bowser in a letter late Tuesday to reconsider. He said that the mayor and any other district employees who spend money or time implementing any aspect of the initiative could face prison time for violating federal law. "The penalties are severe, and we're serious about this. Nobody's wishing or wanting that to happen, but the law is clear," Chaffetz told the AP. Bowser responded sharply even as she tried to ratchet down the conflict. "Bullying the District of Columbia is not what his constituents expect, nor do ours," Bowser said. "We do disagree on a matter of law. There are reasonable ways to resolve that without us threatening him or he us." It would be up to the Justice Department, not Congress, to prosecute District officials, and that scenario appears unlikely. However, Congress could sue the city, and House Republicans also could retaliate by pulling federal funding for city programs. Rep. Mark Meadows, a Republican from North Carolina, co-signed the letter to Bowser late Tuesday, which warned that by spending money to change pot laws, District officials would violate the Anti-Deficiency Act, which prohibits spending of unappropriated federal dollars. The oversight committee also demanded to see all District documents detailing money spent and time put in by city employees to implement the initiative. No one has ever been convicted of violating the Anti-Deficiency Act, although city and federal workers and agencies have been punished administratively for violations. "The real power Congress has is the power of the purse," said Raskin, who also serves as a Democratic state senator in Maryland. "They can exact their retribution financially against the District." Congress hasn't struck down a specific city law in 25 years. Instead, members often add language to critical pieces of federal legislation to undo city policies they don't like. The language on pot was included in a spending bill President Obama signed to keep the government running.